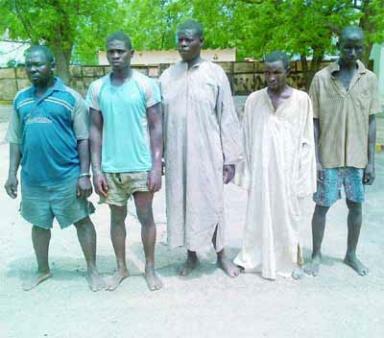 Meanwhile, Spokesman of the Joint Task Force (JTF), Lt Col Sagir Musa, who paraded the suspects said the task force believed the seven men were involved in the Biu Church attacks. He, however, said the security agencies in the state needed the cooperation and partnership of the people to succeed. “Handling of the security situation in the country is a collective effort and as such, security agencies should not be left with the responsibility alone. There is need for partnership because it is everybody’s problem. It is time we saw it as our problem especially in making information avalaible,” Lt Col Musa said. Also reacting to allegation of harassment of civilians by the JTF troops, the spokesman assured that the leadership of the task force would continue to preach, sensitize and educate the personnel on the need to maintain discipline even in the face of frustration. He noted that maintaining maximum discipline among troops was one of the major challenges of any internal operation by security agents but appealed to the people for understanding. LET INFESTIGATION START IMMEDIATELY,AFTER THEIR COFESSION. MAY GOD CONTINUE TO EXPOSE THEM.THEY DESERVE SHAMEFUL DEATH BY HANGING. Dos dt didnt belive given dem N7000 should. Cuz even less than to killed a pastor if u dont talk more of a church. Let me tell something. Either you collect N7000 to bomb a church or not, that one is your problem. But remember that people you kill also are human beings like you. For curse shall not depart from your house. You shed blood in this land. God will send the spirits of this land against you and your household. Imagine if so called “ALLAH” of yours is God Jehovah, He won’t say that if you kill for your belief, “Islam”, he will give you 6000 virgins or how many? You are all deceived. Allah of Quran is not God of Heaven and the earth. You. are fanatic.. How could. you. say what. u have no knowledge. of? Iguessed u are drunk. @ Abdulsalam- another Boko Haram talking. You Hausa Muslims are Nigeria problem. My question is directed to any peace-loving muslim….Is it really TRUE dt Allah has promised its followers 6000 virgins to anyone who kills on its behalf? May God help us and fetch those that are killing innocent people in the name of Islam, anybody tell you that there is a Religion says Kill your fellow human being tell him is a lie, if killing human as a name of Islam then there is no way Saudi Arabi, where islam came from you will find Other Religion, is just a less knowledge people poor witch Trying to spoil the Religion,, please your self this question, is it only Nigeria that Muslims and Christians are combined together? If no then why the rest of the world are not killing their fellow human being? Please we have to use our imagination and knowledge to answer the questions. Ceejay, let me use dis medium 2 answer ur question. I really like d way u addressd it and I knw how u feel. I am a Muslim, what I knw is that there is no single verse in d Holy Quran dat says you should kill innocent soul in ordet 2 get sumtn either in dis world or hereafter. To comfirm it U can check d English translated Quran and even d Hadith. ijbabs, what ever you called ur self, people like ur are the no1. Nigerian’s problems, that you cannot evn see the truth of any matter apart from hetrate. you must be very stupid and illiterate. muslim love Jesus, that they always salute him. but you people dont evn know where you are heading to, you are all confused. may almihgty God punish you severely. go to hell. You guys are lost, what brought about the insults? Remember, if their is religious tolerance within you no one will hate each other’s religion. We love our religions but we don’t practice what it teaches us. Let us live by the teachings of our religion and God will restore peace to our land. If you will tell yourself the truth, 99 % target are Christians. If you go to Mubi, there is no single Church they have not laid hand on all in the name of love for religion. If living your religion is hatred for my religion to that extent, tell me how possible am I not to believe your religion is not diabolic and based on lies rather than all fabricates that it is the religion of Peace? Wolves in sheep’s clothing. May my God “Jehovah” have mercy on you or else you are all doomed and ready for His final judgement.